The recent (and wonderfully unexpected) freeze in Houston got me thinking, I’m inside with the heater on and I’m STILL cold, how on earth do animals that live outside do it? Well…they freeze! The most extreme critter-sicles that I’ve found happen to be amphibians. 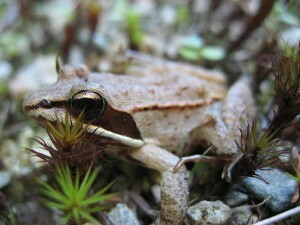 Take the Common Wood Frog, for example. It has a trait known as freeze tolerance. What this means is just what you think; it has the ability to freeze solid, form ice within its body, and basically hibernate in a state of suspended animation. During this time it has no heart beat or measurable brain activity, and its metabolism slows to a glacial speed! As the frog freezes, ice forms in its body cavity, drawing out the cells’ water and its liver pumps out massive amounts of glucose, protecting its cells from solidifying and turning the liquid in its veins to syrup (think maple). I don’t know about you, but having 50 times as much sugar in my blood as a diabetic does NOT sound like the start of a good nap. After a few months of froggy deep-freeze, the Common Wood Frog slowly thaws from the inside out – its heart begins to beat, its metabolism jump-starts. After what we would deem an arduous slumber, this little ranid hops away to find the closest mating pool he can; the breeding season for these guys is only a few nights, instead of the typical few months! Talk about baby-boomers. You may be thinking, as one of my good friends often does when I exclaim scientific facts, “Erin, that’s all pretty neat-o, but why should I care about a frozen frog?” Let me fill you in. Scientists right now are using nature’s model to try and extend the shelf life of donor organs. The staggering fact is that, of the thousands of people on a waiting list for new organs, only a small fraction will get them in time. Usually, an organ, once removed from a donor, must find a new home within 6 hours of excision-even on ice-or it is no longer viable. If, through the study of cryogenics, we could extend that time to say even 24 hours, just think of the number of people that could be saved who wouldn’t have made it because of the distance between donor and recipient! If a donor’s kidney, for example, could be frozen and stored without the typical associated damage, surgeons could dramatically increase the number of transplants they perform every year. Now, whoever said that science wasn’t cool never heard of a frog-sicle. I can’t think of anything cooler.